American Bulldogs are prone to hip dysplasia. It is important that when contacting a American Bulldog breeder that you express health concern issues and ask the breeder what they are doing in order to help mimimize them. Please don't purchase your American Bulldog from a petstore which commonly are known to support American Bulldog puppy mills. Doing so only promotes inproper breeding ethics and promotes current American Bulldog health issues. The ABA, NKC, ABRA, UKC registries recognize the American Bulldog breed standard. Dog Breeds are being listed in alphabetical order, you may also view our complete dog breed list. Country of Origin: The American Bulldog originated as a catchdog (mostly cattle) and property protection dog, in America's Southeast. He was not bred to put on threat displays or to look a certain way. But, he did need the right equipment to take care of his real bulldog duties which were confrontational personal and property protection and as a catch dog. He needed to be strong enough to put unruly bulls on the ground and athletic enough to catch hogs that were allowed to free range in a semi-wild state. Known originally as the Old Country Bulldog or Old English White. Quite similar to the old 17th century bull-baiter. 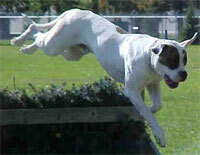 Character: The American Bulldog is strong, alert and agile. Temperment: Requires strong socialization. Can be around children if properly trained. An aggressive instinct towards other animals from bull fighting origin. Care Use a coarse comb when shedding - otherwise, little grooming is needed. Colour: All white, pied, or up to 90% color [brindle or red patches, (red is defined as any shade of tan, brown or red)], with a portion of the white on the head. Comments: The American Bulldog has a self-assured attitude whom is also alert, outgoing and friendly. Some assertiveness toward other dogs and aloofness with strangers is not considered a fault.